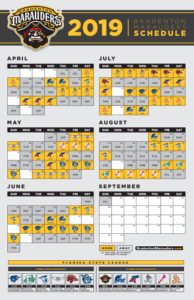 The Pittsburgh Pirates today announced the 2019 Spring Training ticket information for games to be played at LECOM Park in Bradenton, Florida. 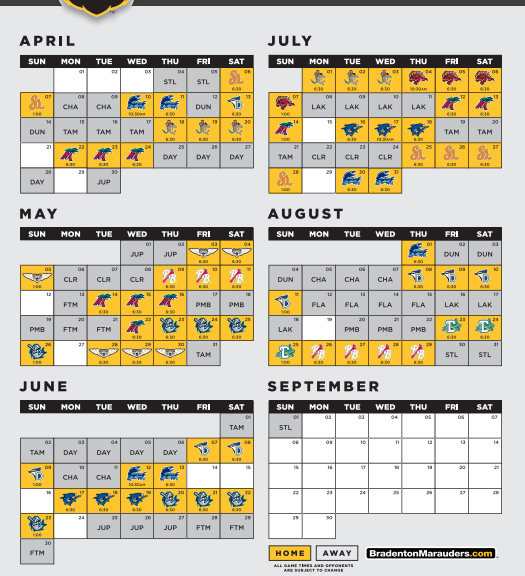 Last month, the Pirates announced the 2019 Spring Training schedule and home game times for their 51st spring season in Bradenton. Click here for details. (BRADENTON, FL) The Bradenton Marauders today announced their schedule for the 2019 Florida State League season. The High-A affiliate of the Pittsburgh Pirates kicks off its 10th season at LECOM Park on Saturday, April 6 at 6:30 p.m. against the St. Lucie Mets (New York Mets). The Marauders begin the campaign two days earlier against the Mets in Port St. Lucie. Bradenton will host 71 games at LECOM Park in 2019. The Marauders will contend in the South Division with the Charlotte Stone Crabs (Tampa Bay Rays), Fort Myers Miracle (Minnesota Twins), Jupiter Hammerheads (Miami Marlins), Palm Beach Cardinals (St. Louis Cardinals), and the Mets. The Marauders have qualified for the playoffs four times in the franchise’s first nine seasons, and captured the franchise’s first Florida State League championship in 2016. The Florida State League utilizes an unbalanced schedule, creating plenty of opportunities for fans to see top prospects from North Division teams. Bradenton’s North Division opponents include the Clearwater Threshers (Philadelphia Phillies), Daytona Tortugas (Cincinnati Reds), Dunedin Blue Jays (Toronto Blue Jays), Florida Fire Frogs (Atlanta Braves), Lakeland Flying Tigers (Detroit Tigers), and Tampa Yankees (New York Yankees). Bradenton’s annual Patriotic Celebration and Independence Day fireworks show will take place on Wednesday, July 3. The Marauders will host the Jupiter Hammerheads at 6:30 p.m. The spectacular post-game pyrotechnic display will be one of the can’t miss events on the Suncoast this summer.